If you have been following the Tech Industry from the past few months you would have heard about OnePlus 2 from the brand OnePlus which is one of the highly seeked Smartphone in the current market. Well keeping the specifications of this device aside, the most Important aspect of this brand is its Marketing which is planned in a very unique, smart & a way which creates a demand for the product long before its even officially announced. OnePlus as a brand which launched it’s first Smartphone in 2014, a year later announced their product in one of the most creative way which was done through a VR Cardboard Kit through which the whole world could follow the launch simultaneously from their home & know about the product. Unlike the other product launches where we are invited to different cities, this launch was very creative and the #HYPE was real since it was something which no one had ever thought about. A journalist, Blogger, Tech Enthusiast or even a common man given an equal opportunity to know about the product and because of which the product was trending on the Social Media during the launch. 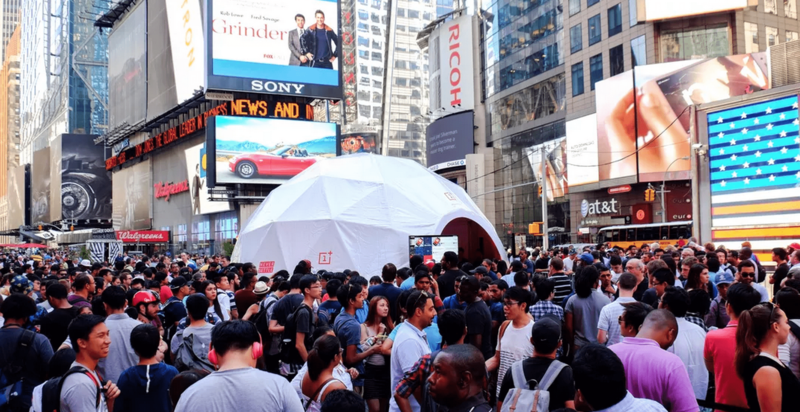 Following the launch, OnePlus came up with pop-up events in Time Square & multi-city fan meets where we could see real fans queuing up on the streets to get a glimpse of the new smartphone. This is something we have seen earlier only at the Apple launch events & it is inspiring to see that finally there’s an Android Smartphone for which people would be connected with emotions. We have already talked about the product in our OnePlus 2 Review & also our story on the Missing Features on OnePlus 2 but what’s more Important is the guerrilla marketing the team has Implemented. Every agency tries to work on out of the box ideas but end up doing something similar or something inspired from others. Before the OnePlus 2 was launched, the brand had hinted about a Global Launch which everyone could be a part of & then came the announcement of VR headsets. The brand sold the Cardboard 2.0 with a tie up with Amazon India & also sold it through their own website in the US at a very basic price of just Rs 99 plus shipping. Of course keeping the price aside, the idea itself would crave users to buy one & experience this new way of consuming content, since the cardboard could be used later with any 360 degree video hosted on YouTube. This launch attracted a very large audience world wide who were hooked up to this innovative type of launch & not primarily for the product but the unique idea through which they could get first-hand information on the product being unveiled. To put in context, the searches for the phone were higher than a well known celebrity. [quote align=’right’]Products keep coming & going but what stays is the brand & that’s what matters. [/quote]During a meet with Vikas Agarwal, General Manager of OnePlus India, he mentioned about the focus on the brand & connect with their users is more Important for them. Different brands come up with different marketing ideas to sell their products but what unique we have seen with OnePlus is that they are building a brand on which users could trust in terms of the product, support, resale value & team being open to the users. Consumers don’t spend their money on just the product but they first look on the brand before spending their hard earned money & which is where we have seen Apple getting the highest revenues & word of mouth from their own users. Now Let’s talk about the numbers which this brand has achieved. There are just two models launched while the third one i.e. OnePlus X going to be launched soon. 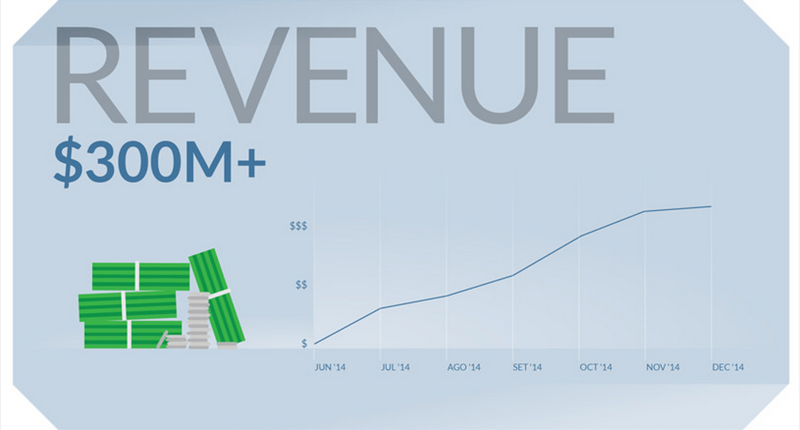 According to the Annual Report Card, the total revenue was around $300M+, which means that the brand sold over a Million Units of their first generation device. HTC One M9 was the flagship device for the brand which was launched with a large marketing spend & was expected to be a large success for the mobile brand. 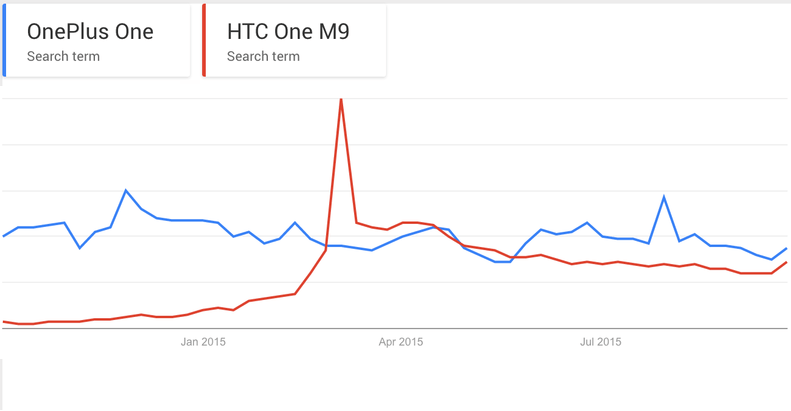 We did a quick look on the Google Trends which shows the results based on the searches & user interests, that proved that the OnePlus One was in more demand than the M9. The above numbers, trends & mentions about the brand were all possible because of the Smart Marketing by the team. According to the few words on the marketing by the brand, they spent no more than $300 before selling half a million units. It is obvious that later they spent some money on the marketing, but that was for the activities mentioned below. Recently when there were delays in the shipments of the OnePlus 2 & Carl Pei, the Co-founder of the company posted a public apology which was a open discussion on their forum. He not only shared the reasons why there was a delay but also what they plan & ensure that the devices reach the prospective buyers quickly. Generally if you are a journalist or a media personality you will have to go through a hierarchical system to reach the top level executives of a brand to get an answer which generally starts with the PR agency. But what we have like with these new brands like OnePlus, Xiaomi etc .. is that the Founder, CEO, Head of Marketing are all available on the Social Media for a quick answer to your queries. This is again an unconventional approach but very welcomed even by the consumers because they know the team who is working on the product & connect with them directly for any issues. Oh, by the Way did I miss mentioning that the most Inspiring part of this story is that the Brand has less than a hundred employees according to their Annual Report Card, while the average employee spent 12 Hours a day, 6 days a week which clearly points that they are highly motivated & focussed towards their job and thats the startup spirit which is seen here. With these steps, initiatives & smart actions, we can say that OnePlus is the Smartest Phone brand of this decade.